Daily Prompt: You need to make a major change in your life. Do you make it all at once, cold turkey style, or incrementally? I think this depends on what kind of change we are talking about. Overall, if given the choice, I prefer to make changes gradually. I think all people are different though and some people just prefer to make changes cold turkey. One example comes to mind. My mother was a heavy smoker. She grew up in the 30s and 40s when smoking was I think somehow glamorized for women. She began smoking at an early age and by the time she was in her 40s and 50s, she was smoking 3 packs of Pall Mall cigarettes a day. She bought them by the carton and I rarely can remember her when she didn’t have a cigarette in her hand. She had tar and nicotine stains on her fingers from her constant smoking. Her three daughter’s clothes reeked of cigarette smoke wherever they went. My mother tried many times to cut back or stop smoking and wasn’t successful. Then in 1985, she was diagnosed with colon cancer. When she went in the hospital for her resection and anastomosis, she was put in the room with an elderly woman who was dying from lung cancer. This woman had tubes that were suctioning bright red blood from her lungs and chest to a container on the wall. She was on oxygen and struggling to breathe. My mother said this woman begged her more than once to please light a cigarette for her. My mother refused (for obvious reasons, one of which was all the oxygen in the room). I remember coming home from veterinary school on the night of my mother’s surgery to visit her in the hospital and the woman asking me PLEASE to light a cigarette for her so that she could just have a few puffs. My eyes looked at the blood coming from her lungs. I shook my head no, and told her I was sorry. One day, a pulmonologist walked in the room to talk to this lung cancer patient. There was a curtain between my mother and this woman’s bed, and the doctor sat on the patient’s bed and proceeded to pull the curtain. My mother heard every word he said to this woman. This doctor laid it on the line for her and boldly told her that she was plain and simply killing herself with her cigarettes. He gave her quite a lecture about her grave situation, the anatomy and physiology of the lungs, and described in detail, the lung pathology she had incurred by smoking. My mother heard every word, and though she said she knew the lecture was meant for this other patient on the other side of the curtain, she took it very personal and felt that it had been directed right at her. In short, my mother decided that day, that she was never going to pick up another cigarette. She never did. My mother lived 21 years after this hospital incident and never touched a cigarette again. She always said that she believed that stopping cold turkey was the only way to go when it came to smoking. I also heard her say many times during that 21 years, that she wished she knew the name of that doctor, because she would have liked to have personally thanked him. Unfortunately, the lung cancer patient continued to beg everyone who entered the room for a cigarette. My mother recalled reading the woman’s obituary in the paper shortly after she got out of the hospital. I’ve known lots of people who have tried to quit smoking. Some have been successful, others haven’t been. The ones I’ve known who have been successful at it have usually been the ones like my mother, who quit cold turkey– who just one day decide they’re never picking up another cigarette. This entry was posted in Addiction, Change, Daily Prompt and tagged Cancer, Daily Prompt, death, making changes, memories, smoking, wordpress. Bookmark the permalink. Stopping smoking suddently is a lot easier if there is a catalyst for the change. I tried several times by ‘weaning’ and patches, both of which only made it harder. My friend was 24 when she was diagnosed with lung cancer. Previously she was fit and healthy, and didn’t smoke. I smoked, and felt stupid for it. She was in hospital witnessing people like the person who was next to your mum, scared for her own life and watching friends needlessly cause damage to their bodies. I stopped smoking, but it only lasted 8 months, and then for some weird reason I started smoking occassionally. I wonder if I started smoking again because my friend is in recovery, and therefore the danger and effects are not so prominent in my life? I decided to stop again, and went cold turkey. So far, so good. I’ve heard other people say the weaning down and the patches only made it harder too. I’ve never been a smoker so I can’t speak from personal experience but the friends I have who have been successful at smoking cessation have been those who just quit cold turkey. I have a friend now who says she desperately wants to quit but I often hear her say she doesn’t because the “damage is probably already done” and she “will probably die of lung cancer regardless.” Personally, I can’t quite grasp her way of thinking but my aim is never to lecture smokers, so I don’t. I wish you all the best in this endeavor!! Gail, I’m glad we’ve connected. I’m a cold turkey changes type of gal myself. 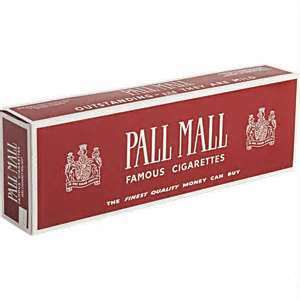 My dad smoked Pall Mall as well ~ 2 packs as day ~ and he quit just like your Mom.and lasted 22 years before passing in 2012. He always said it was the hardest thing he’d ever done, but that it had to be done cold turkey! My mom also said it was one of the hardest things she had ever done too and that her cravings for a cigarette lasted for years. I remember her saying it was hard for a long time to be in the presence of other smokers as it always made her want to have a puff. My mother was never a big eater of sweets until she quit smoking and boy did she really start eating sweets, especially chocolate during that time.